Either fictional characters exist or they don’t. When speaking about Raskolnikov, land surveyor K., or Batman, it might appear that we make statements about actual people, especially to any eavesdroppers who aren’t aware that we’re speaking about fictional characters. “Honey, I overheard someone talking about an eccentric millionaire with a dark past, devoted to fighting crime.” It is unlikely that an overheard conversation about Batman would be taken to be about an actual person, but what if someone were to overhear an account of a young man’s bad choices and descent into drug addiction, without knowing that the speaker was recounting scenes from Requiem for a Dream? (Aronofsky, 2000) “He began using drugs socially—it was normal, accepted, just a way to have a good time once in a while…” This predicate is true of Harry Goldfarb, although there has never been a Harry Goldfarb of whom the predicate could be true. He has never existed as an actual person, by which I mean as a physically existing human being. Harry Goldfarb is a fictional character in a film. Hence, so goes one argument, fictional characters do not exist. They have no referents. And yet, statements can be made about them, verified, rejected as untrue, accepted as likely, endlessly debated, and so forth. In short, there are fictional characters, but they are nonexistent. Two main methods for countering such a discomforting statement should be mentioned: Either a realist ontology of fictional characters, as Maria Reicher puts it (Reicher 2010), or fictional characters as make-believe, a position associated with Kendall Walton (Walton 1990). In the former, fictional characters are said to exist independently as abstract objects; they are “neither mental nor material, nor do they exist in the mind of a particular subject (Reicher 2010, pg.114). Fictional characters can thus easily be instantiated across several works, or even different versions of the same work. The Batman of the comics is the Batman of the films. This is a neat solution—as long as you find abstract objects palatable. But—where are these things kept? Are they eternal? Was Batman created or found? Many objections have been raised against the independent existence of abstract objects, of universals, platonic forms and the like. It’s outside the scope of this essay to explore them all, but there are enough of them to point to a general dissatisfaction with such ideas. What of fictional characters as make-believe? In saying, “land surveyor K. is doomed to never make sense of The Castle’s abstruse bureaucracy,” I am actually saying, “let’s pretend that there exists a certain land surveyor, whom we’ll call K., and let’s pretend that he is doomed to never make sense of The Castle’s abstruse bureaucracy.” Together we play a game of make-believe, and whatever falls under the category of fictional is “true in the appropriate game of make-believe” (Kendall 1990, pg.24). Since we are only pretending, it follows that the emotions we experience are not genuine, but, in Walton’s own words, quasi-emotions; a result not of a belief in the existence of a land surveyor trapped in a bureaucratic nightmare, but of a pretended belief. The lack of an existence belief renders the frustration, fear, and mirth in response to K.’s plight fictional, despite their being physiologically identical to “true” emotions. The pretend theory keeps fictional characters bound to state of nonexistence and consequently asserts that any emotional reaction they call forth is not genuine. An alternative avoiding the problems of both a realist ontology of fictional characters and a pretend theory is, I think, to found along the lines of fiction-as-simulation. When we read about, or watch, Batman gripping the steering wheel of the Batmobile, hitting the gas and being pressed back into the seat by the force of the acceleration, a curious thing happens to our brains—they “respond as if [we] were performing the same action” (Oatley, same). This response is naturally a measurable, physical phenomenon. Watching Batman whipping through the rain-soaked streets of Gotham in the Batmobile by night is, as far as physiological brain processes go, not very unlike doing it yourself. (Albeit, strictly speaking, not unlike doing it in a Batmobile-like vehicle and in a Gotham-like city, since both the Batmobile and Gotham City are nowhere to be actually found.) Fiction’s effects do not end there. Oatley’s research shows that fiction effectively simulates social interaction, effecting small but persistent changes in personality. Anton Chekov’s The Lady with the Little Dog has indeed been proven to make you more empathic—if you take the time to read it. The hardware between our ears neither pretends nor distinguishes metaphors from their literal meaning. The regions that light up at the mention of a dirty deed are the same ones that react to the sight of day-old dirty dishes in the sink. Without physical disgust there is no moral disgust, as discussed by Robert Sapolsky in his lectures on human behavioral biology. Speaking of simulations invites talk of software and computers. In order for a program to run, its code—its instructions to arrange (physical) bits in this or that configuration—is needed, along with a compatible piece of hardware whose bits are to be manipulated. But every brain, every piece of “hardware” is different. Everyone who has read The Castle sees K. a little differently in their mind’s eye. It isn’t unusual, upon watching the film version for the first time, to make a remark like, “yes, I can see that it’s Sherlock Holmes, but I imagined him a little bit differently.” Daniel Dennett makes a strong case that the brain is a computer—just not one with the top-down, hierarchical architecture of our desktop PCs. A network of semiautonomous agents, namely nerve cells, self-organized in parallel, is perhaps not ideal for computing square roots or asteroid trajectories, but it still is a computer: Data flows in, is processed and exploited to yield control of behavior. (Dennett 2017, 07:54) A computer is determined by function, not by the material from which it is built, nor by its system architecture. No two brains are identical. It consequently becomes troublesome to say that the Batman in my head—observable as these or those brain processes, as neurons firing, brain regions lighting up, or however we may express it—is the same fictional character in someone else’s head. That is, in a brain physically different from mine, subject to quantifiably different activity. Slightly different groups of neurons fire, the active brain regions are in slightly different places, and so forth. The term neuroplasticity has entered common parlance; it has become common knowledge that the brain can reorganize itself and construct new pathways if necessary. No two brains’ being exactly alike is now common knowledge. I very much agree with Daniel Dennett that the solution to the trouble of obviously non-standardized brain hardware lies in the idea of virtual machines. These are programs that allow a certain hardware and operating system configuration to run platform-independent software. Java is omnipresent and Java apps will happily run on Linux, Windows, or Mac OS, just as long as the operating system–specific virtual machine is installed on the computer. Java coders do not need to know whether they are coding for Windows or Linux; a virtual machine will “translate” the instructions for its corresponding operating system. The English language, according to Dennett, can be regarded as a virtual machine, as a program permitting one to understand utterances made in English, regardless of one’s unique brain. With the exception of rare cases, every brain is capable of “running” English. Structural variations, tissue connectivity, and so forth do not, past a certain minimal level, matter. Provided that a brain is reasonably equipped with the English language, the statement, “the window is open” is hardware-independent. The brain in question must of course be acquainted with windows, opening, walls, solidity, and a list of other required “software,” the complete enumeration of which would be, I suspect, probably impossible. The code that generates a fictional character can be transmitted verbally, textually, as a combination of words and pictures; as in a comic book; or in the form of moving images, recorded speech, and music—a film. One’s particular simulation of a fictional character can be more or less complete, and more or less accurate, depending on the volume of fictional-character-generating instructions received and the extent of their processing. There is no absolutely definitive Batman or land surveyor K. or Sherlock Holmes. My Batman is your Batman so long as both have in common all of the features transmitted by the code. Brains are, however, more fluid and adaptable than hierarchically structured desktop computers: If a piece of information is missing, as, for instance, when the meaning of a word is unknown, or even if an entire line of text is skipped, the effect on the generation of a fictional character is generally not disastrous. Photoshop CS2 is Photoshop CS2, regardless of the computer platform it runs on. But—one machine’s CPU might be faster than the other’s. One might render the graphic user interface with different window borders and fonts. The level of variation between the same program running on different computer platforms is perhaps not so great, but it should be borne in mind that these machines are far simpler and far less chaotic than our brains. In his book Foundations of Language, Ray Jackendoff describes words as semiautonomous information structures, a predicate that might as well describe software and its component parts. The meaning of a word is then, in my mind, stable. Window will never mean house, although it can be used to denote something that is structurally or functionally like a window, but is yet unnamed, or the word for which I simply don’t know. The windows on ships are called portholes, but even if I didn’t know that word and instead said window, or round window, I would be understood. A fictional character is atomically composed of words and is hence a semiautonomous, generally stable information superstructure. Batman chases criminals and does not hesitate to use physical violence against them, but he would never kill unless he had no choice, nor would he knowingly harm innocent bystanders or accept their deaths as collateral damage. I am able to generate (to run) Batman reasonably well, having read several of the comics and seen the films and thus make my assertions with some confidence. Furthermore, because I can do this reasonably well, I cannot state without feeling that I am lying that Batman would, say, sacrifice the lives of a several bystanders to apprehend a villain. Once a fictional character has been developed to a certain point, he, she, or it (as in cases of sexless robots, artificial intelligences, living planets, or hive minds) can be placed in an environment with other characters. The author calculates the possible interactions between them and documents the course of the simulation. The author specifies the starting conditions and reports the results. Authors are not closed systems, they are always situated in a particular milieu. Any number of factors present in that milieu can affect the outcome of the simulation: a gust of wind, a headache, the smell of coffee. Despite knowing the initial conditions of the simulation it seems impossible to predict exactly what the results will be, but it is possible to determine whether they are generally correct, and whether they break any of the rules laid out at the beginning. The quote above refers to fictional characters as people. This is quite natural. I recall once reading something like the following in a story by Isaac Asimov: The beloved does not actually exist, but only a person who reflects the lover’s image of the ideal partner with the least amount of distortion. How often do we fall in love with fictions? More prosaically, how very normal it seems to say something like, “I can’t believe he did it—I thought I knew him.” The actual physically existing people in our lives are the sources of simulations in our minds. These tend to possess a greater degree of verisimilitude and dynamism than the characters we have come to know through fictional works. Interactions, especially of a novel sort, with the person on whom the simulation is based are occasions to add a line or two of code, chances to improve the simulation, to, in other words, better know our friends, lovers, and family members. I hate dinner parties and was until recently unaware of the degree of careful thought that went into the seating arrangements, which my wife attempted to explain to me. Pablo cannot be seated next to Peter because they are both introverts with nothing in common and will not talk to each other. Mindy and Muriel should be seated as far away from each other as possible because of mild, mutual enmity born of opposing political views. Familiarity with the guests combined with a high degree of social intelligence permit a reasonably accurate simulation of the coming event. A fictional character is a semiautonomous, generally stable information superstructure. Such an entity does not exist independently but must be generated by a brain equipped with the necessary verbal and cultural tools to understand the instructions for generating the character in question. Although all brains have somewhat different hardware configurations—by which is meant brain tissue mass, nerve connectivity, and so forth—language plays the key role of a “cross-brain” interpreting tool (a virtual machine). If you can understand a language and have the necessary level of factual and cultural knowledge, you can generate fictional characters. To put things in the language of computing: the brain is the hardware, the story is the code, and the fictional character is the resulting program, and such programs can run on all brain hardware. Batman, land surveyor K, Harry Goldfarb, and Sherlock Holmes all exist, in the same way that Adobe Photoshop, Microsoft Word, and Quake exist: as processes generated on computing hardware by coded instructions. 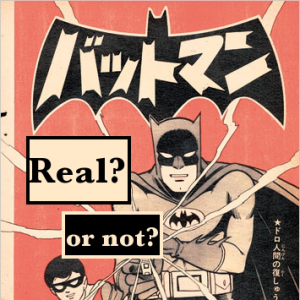 Verifiable claims may be made of the things in both categories: the claim that it is possible to adjust the brightness and contrast of an image in Photoshop is verifiable, just like the claim that Batman is a millionaire who fights crime and is haunted by a dark past. All of the actual people we know—friends, family members, and colleagues are, like fictional characters, programs running on the hardware of our brains. Unlike fictional characters, the instructions for their generation is provided via interactions with actual existing people. This naturally means that we can swap software updates over coffee. Amend, Allison. "Dialogue: Talking it Up." In Gotham Writers' Workshop: Writing Fiction: The Practical Guide From New York's Acclaimed Creative Writing School (ed. Steele, Alexander.) Bloomsbury Publishing, 2010. Dennet, Daniel. If Brains Are Computers, Who Designs the Software? April 6, 2017. Video recording of a lecture delivered at the Royal Institution. Anthony Kroytor is a graduate student who has picked up philosophy again after a nine-year break, which he spent teaching English as a second language.